Here is Part Three of our multi-part translation of an interview with Yu Suzuki and Katsushiro Harada from Japanese gaming site DenFamiNicoGamer.jp. I hope you have enjoyed the interview so far. AI and interactivity in games. The timing for choosing to start developing Shenmue III. Advice from Yu Suzuki to the younger generation. The interview translation starts below. Q: Suzuki-san, I’d like to take this opportunity to ask your thoughts about technology trends. I tried play testing it in places like Joypolis*, but there was a hygiene problem for its use in arcades. The thing was whether young ladies would want to wear the headset after it was used by greasy middle-aged guys... Whereas with movies you can use throw-away glasses. *Joypolis: an amusement park operated by Sega Live Creation Inc. (as of Jan 1st, 2017 there are plans for its sale to a Hong Kong corporation). 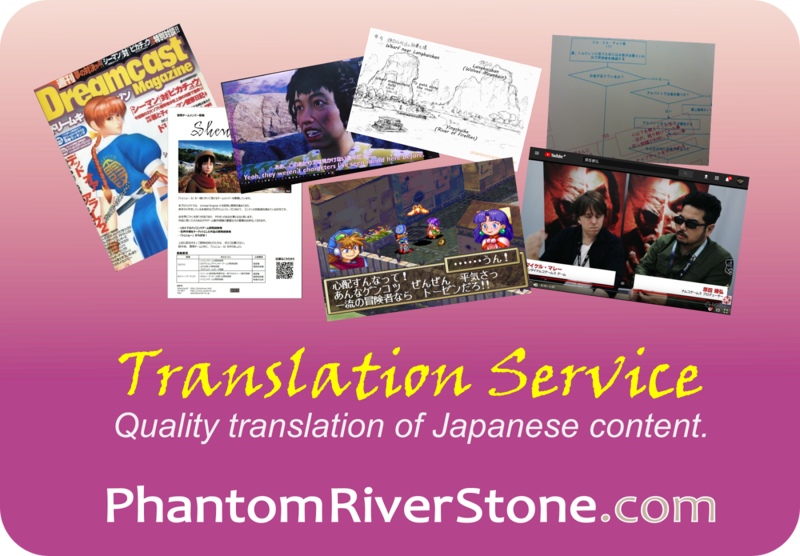 It is operated in three locations in Japan: Odaiba in Tokyo, Umeda in Osaka and Okayama. KH: Precisely! Actually that’s the first obstacle to its use in arcades. We also tripped up on this at the VR facilities in Odaiba – and what’s more, if you wear it for over 20 minutes, the lens fogs up. I had a part of a game set inside a cockpit where you’re wearing a head-mounted display, so I turned this to our advantage by making use of the sensation of wearing a headset to increase immersion. YS: But technology and know-how has caught up. With improvements in detail, the sense of reality when life-size characters approach you will make your heart skip a beat. Alison in Summer Lesson (2015 demo from E3) is finely crafted. From her face to her hair, I thought everything was in exquisite proportion. Although, it’s a shame that the VR of today isn't wireless. KH: I had a phone call from someone the other day, too, saying they were really impressed with Summer Lesson, and suggesting having a drink together again soon. Q: By the way, in addition to VR is there anything else you are studying? KH: I also think that AI will have a big effect on entertainment. If AI characters around you will act out a drama, then I think we’ll reach an era where humans won’t be needed anymore for multiple-player MMOs – or to put it another way, playing with humans will be old hat. I think that the introduction of AI characters that can act socially with humans and further more can act dramatically will make people want to go straight back to the world of games. *MMO = abbreviation of Massively Multiplayer Online. An online game where a large number of users log in to the same server at the same time and play in the same shared space. Q: Certainly, if we compare Shenmue with current open-world games, whether AI characters are present is a significant difference, isn’t it. YS: There’s practically no doubt that AI will have a big impact on the direction of games. For the three main elements of digital games are Graphics, Sound and Interactivity. But further evolution in graphics won’t have the same direct bearing on their attractiveness as they once did. That’s because there’s no longer any large differentiating factor with reality, which is unlike the past. KH: That’s right. The times where everybody tried to make in-game graphics photo-realistic is behind us. The range of options has expanded, so now it’s an era of deciding which option to choose. YS: And sound can now achieve CD-quality level with PCM. Meaning that the differentiating factor with other media is interactivity. This is where AI shines. * PCM = abbreviation of Pulse Code Modulation. Analog signals such as sound and images are digitized and stored as values. As no compression is performed, there is no loss in sound quality. 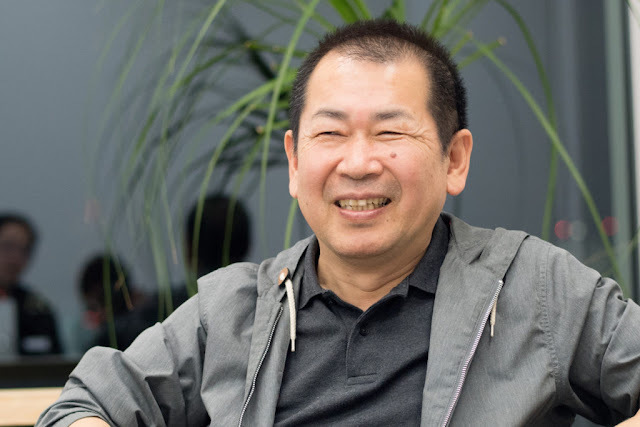 Q: Despite this, as you are actively continuing development, and staying abreast of leading-edge technology trends, what is the reason for choosing to take on Shenmue III at this particular time? KH: I’d like to know, too. Some people even tearfully said, “Please continue on with it, even if it’s as a novel or a manga”. [laughs] Then, just as I had drawn up several plans for what would be possible with a $10m budget, and a $5m budget and so on, someone came into the picture who explained crowd funding to me! Q: It’s as if the voice of the fans literally propelled you forward, isn’t it. YS: Of course I’m not able to take on responsibility for the sequel of his momentous “game”! But I’d like to deliver to him the Shenmue that I can make now. We’re now in an era where a much younger generation than mine is at the forefront of activity. In such circumstances even though I’ve turned 58, to have this kind of chance come along through Kickstarter really makes me happy, and I think all I can do is put everything I have into it, as always. Truly, it's all thanks to all the fans who have waited patiently and shown support for 15 years. "Go Ahead and Do It!" Q: It’s almost time to wrap up the interview but Harada-san, what did you think of what Yu-san talked about today? KH: From way back I’ve thought that Yu Suzuki is someone who is unmistakably a genius. Today that impression has deepened further, although I’ve had to revise one impression of him, which is that his creations have even more fore-planning than I had imagined. There is an artistic sensitivity that can be seen in making the concept for Out Run, while at the same time a scientific intellect that treats the market and game analytically, and above all there is a deep understanding towards technology. I that is truly the Yu-san’s greatness. What’s more, I’m now totally able to appreciate how Yu-san carried out significant decision after decision, surrounded by technological innovation at state-of-the-art offices. “Ah, this is how he made games that are so memorable”. Q: Yu-san too, we have kept you talking until late in the evening, but as I listened today I thought it would be great if you had a message for developers of the young generation. YS: Hmm, I don’t really have anything to say to those creators who are doing well. They don’t need my advice, right? But well, let’s see... I can’t help feeling disappointed that Japan, which held top share in the global marketplace in its heyday, has been defeated like this to those overseas. After all, back when Sega was in its prime, we were a game kingdom that was easily top in the world. So then; why were we defeated? I think it’s because we started to evaluate everything by economic factors alone, and stopped taking on challenges. KH: That’s exactly right! Although it makes my ears burn a bit... Whatever the publicly-stated story may be, it seems that the views of the enterprises are all that remained in force. YS: Nowadays game series have increased, haven’t they. But if nothing new is tried, there’s no future. We have to create something new that can be put to our advantage. Once something new is in place, various tools can be crafted and so on, making it possible to win despite being in the minority. Unnoticed, the spirit of taking on new challenges has faded away in Japanese people. KH: Thanks to the fruits of the labors of Yu-san and the other pioneers, the ways of earning revenue in this industry have stabilized. In other words, since it has turned into big business, it is no longer an era or environment that has that sense of urgency to squeeze out a profit. And so, although we have raised personnel who are skilled in risk hedging, there is not much appetite for new challenges. “Take on challenges and make lots of mistakes!” are words that can be heard in any industry, but in reality there are cases where a failed result leads to a large penalty at the evaluation review and no further attempt ever gets made. Conversely, with businesses that are reasonably stable, it’s common for projects that result in a high profit to be singled out as ones that were “trying something new”, after the event. I think we have to bring back, even just a little, some of the atmosphere of the 90's where repeated attempts and failures paved the way to big hits. YS: That’s why I want the next generation to practice trying new things, not just making things as prescribed on paper. After all, “failure teaches success”. So I just want to tell the young generation “Don’t think about it too much!” [laughs] "Just go ahead and do it". It’s OK to fail, just keep trying. The more you try, the more the way ahead will open up. 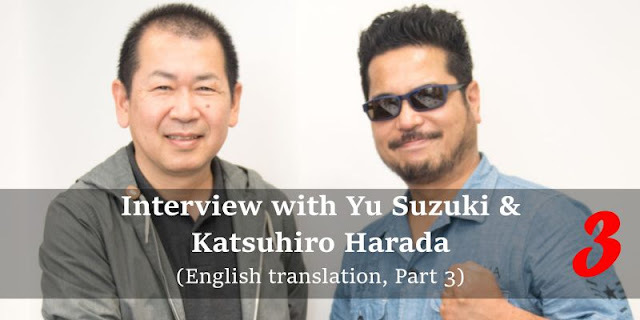 Note: although today's interview part represents the last section in the original article, due to adjustments in the order of translation it is not the final part of the English series. Watch for further parts to follow. You made my day posting this! Such an amazing article with so many words of wisdom! thank you, thank you, thank you! Great interview and great advice. Thank Yu. 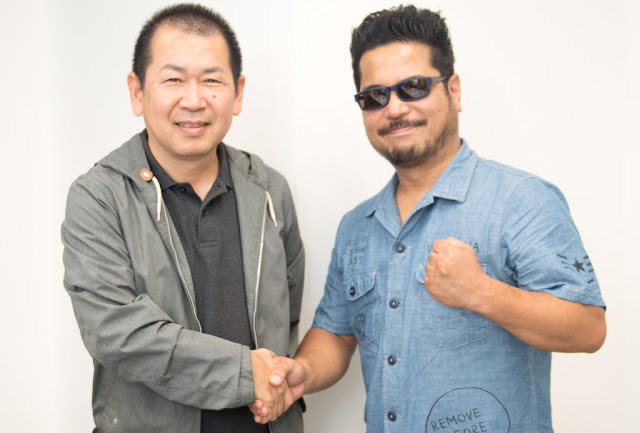 Best of luck on Shenmue 3. You are the best! Yu shares some more stories of his career experience in the remaining parts of the interview too. Watch for them coming soon. This last bit is interesting because by all accounts, Shenmue (unfortunately) /was/ a commercial failure. 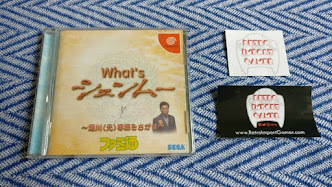 It was extremely ambitious and in the end it didn't work out for Sega, but even so, it was something truly unique and paved the way for the open world kind of games we see today. Shenmue is one of my favorite game series to date and I hope that Shenmue III does well enough that Sega can attempt to put its faith in it again so we can finish the saga. Thank you for your comment! 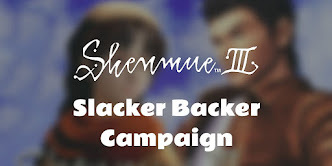 Sega also has a great opportunity right now to capitalize on the interest generated from the Shenmue III Kickstarter if they can manage to release HD versions of the first two games (ideally before the Shenmue III release), which will help attract newcomers to the series as a whole.